All the problem of women, starts with men. 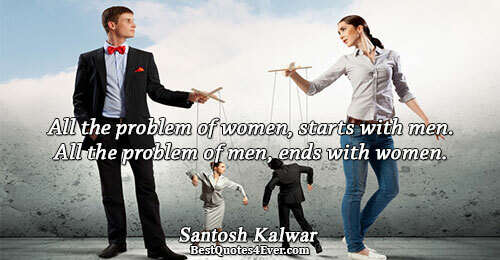 All the problem of men, ends with women. The fastest and easiest way to accomplish any task is to do it with minimum breaks and pauses. The major problem of the world is, most of the people are unjustifiably angry and very few are loving. I don't have problems. I am a writer. I am the problem. Many people pray to be kept out of unexpected problems. Some people pray to be able to confront and overcome them. 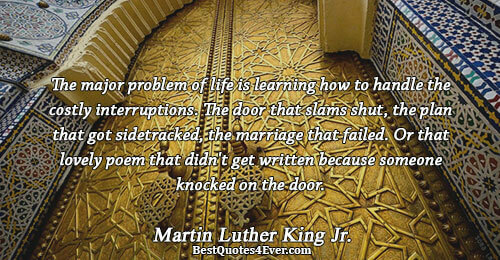 The major problem of life is learning how to handle the costly interruptions. The door that slams shut, the plan that got sidetracked, the marriage that failed. Or that lovely poem that didn't get written because someone knocked on the door. Okay, this is the wisdom. First, time spent on reconnaissanse is never wasted. Second, almost anything can be improved with the addition of bacon. And finally, there is no problem on Earth that can't be ameliorated by a hot bath and a cup of tea. gives answers to human problems and prayers. The problem of God is the problem of gods. The problem of science is the problem of God. To ask the 'right' question is far more important than to receive the answer. The solution of a problem lies in the understanding of the problem; the answer is not outside the problem, it is in the problem. 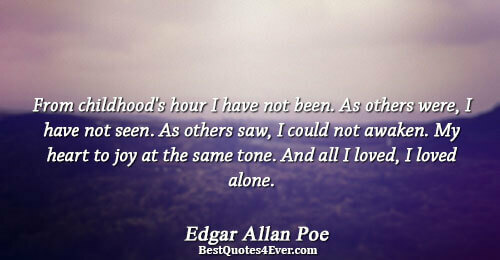 The problem with a man is, he is no more a child. I wanted to thank you," I said. She wrinkled her nose and squinted like I'd said something funny. "Thank me for what?" she said. "You give me strength I didn't know I had,"; I said. "You make me better.